John Fitzgerald Kennedy, born on May 29, 1917, was the 35th President of the United States, serving from January 1961 until he was assassinated in November 1963. At the age of 43, he was the youngest to have been elected to the office, the second-youngest president (after Theodore Roosevelt), the first person born in the 20th century to serve as president. 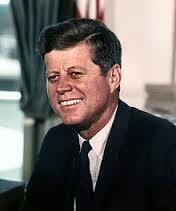 To date, Kennedy has been the only Catholic president and the only president to have won a Pulitzer Prize. Events during his presidency included the Bay of Pigs Invasion, the Cuban Missile Crisis, the Space Race�by initiating Project Apollo (which would culminate in the moon landing), the building of the Berlin Wall, the African-American Civil Rights Movement, and increased U.S. involvement in the Vietnam War. Kennedy was assassinated on November 22, 1963, in Dallas, Texas. Lee Harvey Oswald was accused of the crime and arrested that evening, but Jack Ruby shot and killed him two days later, before a trial could take place. The FBI and the Warren Commission officially concluded that Oswald was the lone assassin. However, the United States House Select Committee on Assassinations (HSCA) concluded that those investigations were flawed and that Kennedy was probably assassinated as the result of a conspiracy. Since the 1960s, information concerning Kennedy's private life has come to light. Details of Kennedy's health problems with which he struggled have become better known, especially since the 1990s. Although initially kept secret from the general public, reports of Kennedy being unfaithful in marriage have garnered much press. Kennedy ranks highly in public opinion ratings of U.S. presidents. He never served as an army officer. The reason behind John Kennedy's murder is still unclear.